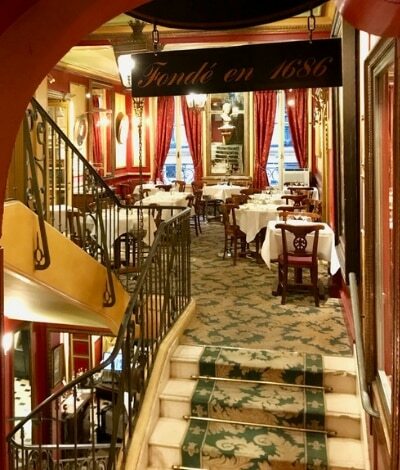 Paris, 2/1/19, Café Procope, in rue de l’Ancienne Comédie, 6th arrondissement, 5 pm. We arrived Café Procope after snaking through the backstreets and across the avenues; its not a likely place to stop, and not one on most peoples itineraries. Nothing calls attention to it’s modest exterior, except maybe the sketch of Benjamin Franklin featured prominently underneath a warm Edison lightbulb in the window. For an American though, this is perhaps the most important place to stop in a city positively bursting with places to have a pause and a ponder, a moment to marvel, pull up for a pig in a poke. You truly don’t recognize what you’re getting inside this modest cafe. 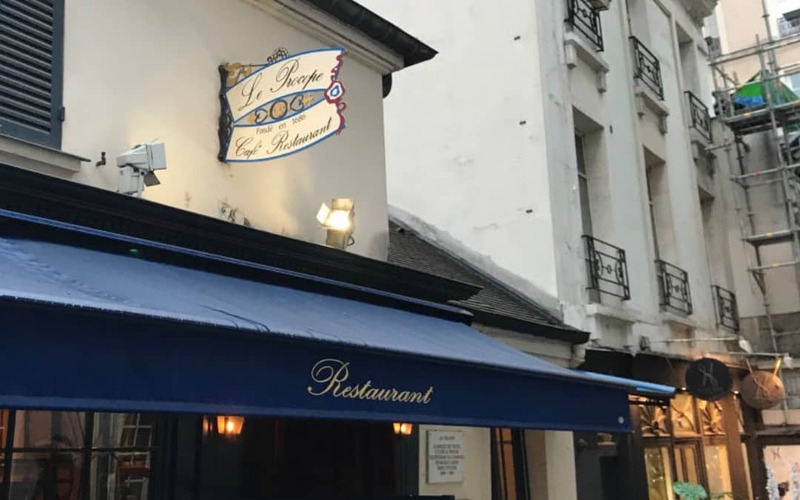 Said to be the oldest continually operating restaurant in Paris, it is Le Procope, est. 1686. This unassuming gathering place was the favorite of the greatest philosophical and revolutionary political minds in Europe and the nascent land of America. Mon dieu and merde sacrée! I lived and breathed in the very rooms where our revolution was born, alongside France’s very own, very bloody uprising. While the popular American meme of the French military as a weak and surrendering force endures, we of the more informed lay-historians know that the French military is perhaps the most fierce, storied, and successful armée in modern history. 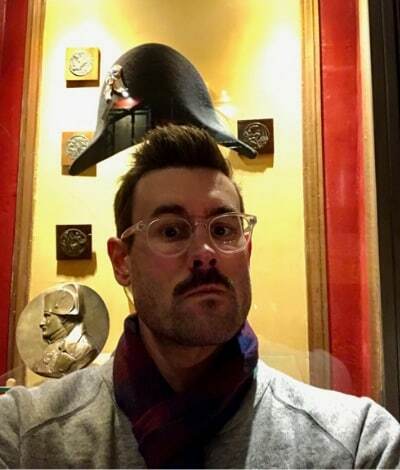 Napoleon anyone? More on him later, but for now it is worth remembering that our French brothers in revolución política were our MOST IMPORTANT ALLIES. Couldn’t have done it without them, and apparently couldn’t have done it without this humble cafe. Thank you my French brothers and sisters. In these rooms, away from the prying eyes of the British, they set their minds and pens and swords and knives and muskets against the status quo. Through peerless and faultless logic they upset the powers that be, with precious coffee and the new inventions of ink and paper and printing presses they used French and English words to actually do the thing! They weren’t shy about it either. Their weapons of the mind, reasoned thought, sarcasm, and a healthy dose of snark were only matched by their generous application of righteous, bloody violence and terror. Upstairs, note the Fleur-de-lis on the carpet. The symbol of the Royals, putting it on the floor where we can walk on it was a not-so-subtle jab. 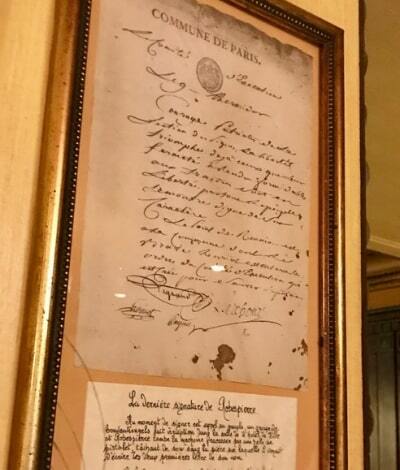 Sitting in this room, looking at the actual blood-stained agreement revolutionary hero Robespierre was signing when he was most rudely and inconsiderately shot in the dang jaw, my skin is on fire with the sheer historic reality of it all. 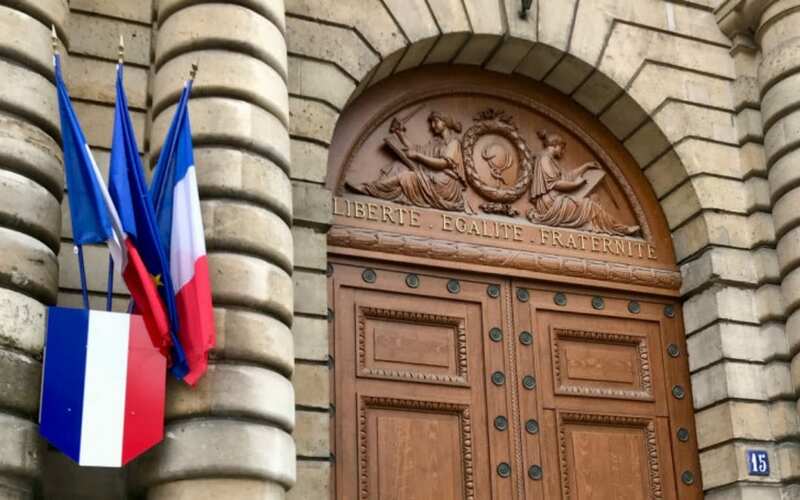 Unfortunately this esteemed French lawyer, champion of the poor and universal suffrage and advocate for the abolishment of slavery, did not die from being shot in the face. I learn that he was the only man to have gotten the guillotine face up, because this was the only arrangement that would keep his jaw from falling off while they did the deed. Maximilien the Jacobin was a certified hero my friends, and the only person to have seen the blade coming and faced it head-on. Maximilien Robespierre, the architect of the French Revolution’s Reign of Terror, was shot in the face while he tried to sign this document. His blood is right there under the glass, right next to the first two letters of his name that he signed before he was shot. “RO. . ,” it reads. The document is casually hung on the wall over a table that you can book for a party of 8 dissident friends because these relics are part of a collection privé (private collection), one that is scattered haphazardly throughout the two-story cafe. Napoleon’s hat is here, he left it in lieu of payment for a bill he sadly never returned to pay. I touched the desks of Voltaire (!) and Rousseau with my own grubby bourgeois hands and had coffee and crème brûlée with 5 new friends in the front room. This only after Costa, our guide, expertly talked the maître d’hôtel into letting this rag-tag group of callow, rain-soaked travelers have a table. No easy trick, I’m told, but fortunate because by this time our fingers are frozen and our caffeine levels are dangerously low. Have I spoken much about the beauty of Paris in the wintertime? They say Napoleon was short, but he was of average height. There are many things to say about him, one thing is that when standing in front of his hat and pondering his military accomplishments he makes you feel very short and inadequate indeed. As we thaw and dry out, the conversation between these citizens of France, Greece, Germany, Ukraine, NYC and Augusta, GA meanders perhaps inevitably to our modern political lives. As young people we can’t help but remark on the irony of these ideas being shared in this historic cafe while our own revolutionary movements are growing in our respective countries. The financial collapse of Greece, the yellow-vest protests in France, Brexit, and whatever the heck is happening in the US. The fascist, far-right, authoritarianism that is gaining steam in Ukraine and many other places thanks in no small part to Russia (though I must say that bigoted, anti-intellectual, superstitious tribalism needs very little help these days). We all agree that these things are connected in the same way ‘Merica and France’s troubles were connected 250 years ago. They all follow from the age-old problem of a shrinking-to-non-existent middle class. Sadly, we don’t solve these modern problems over tiramisu on this day, but thankfully no one is shot in the jaw. Let them eat cake? Non madame, mangez les riches! But I digress, back to the emotionality of this revolutionary stuff. All of the writing, the fighting, the effete, pearl-clutching apologists that would stand in the way, everything that would follow these secretive meetings over espresso, beer, wine, and yes, tea, would culminate ultimately in the toppling of the monarchic rule in France and America. What happened inside these mahogany, silk, brass, and damask-clad walls is what allowed Bradford Stuart Smith to be born in a free Augusta, GA in 1979, 203 years later.